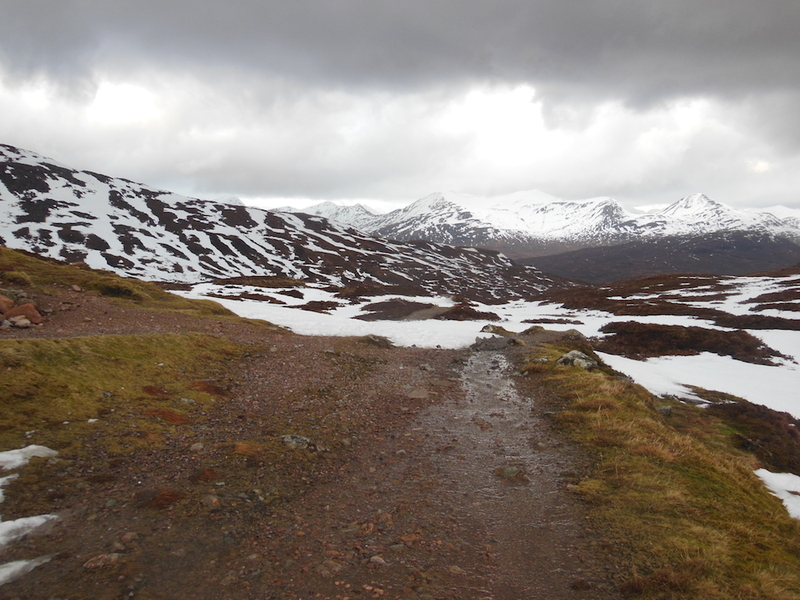 I had been looking forward to getting on the top half of the whw route for the last few weeks and even the poor weather forecast didn’t dampen my enthusiasm. Initially I was going to do this run on my own but my friend Jonny decided to join me. Jonny is working towards the Fling and whw races this year so we had a 35miler this weekend on his plan. 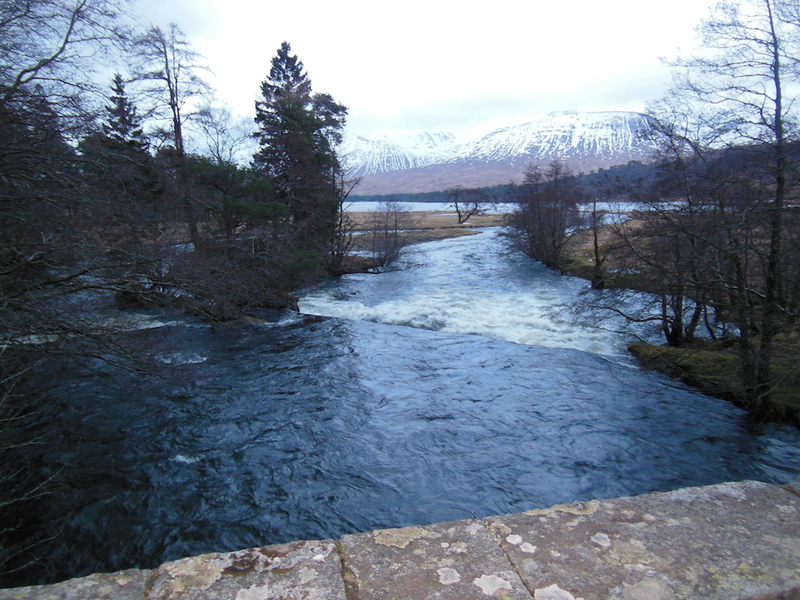 He decided to see how he felt at Bridge of Orchy so had the option to stop there or complete the 42miles. I rode on my motorbike to Drymen on Saturday night where Jonny lives with his partner Frances, who runs the Kip in the Kirk B&B. We were up at 6am for some porridge then left at 7am to drive to Tyndrum. Kirsty at By The Way kindly let us leave the car there and have a shower at the end. 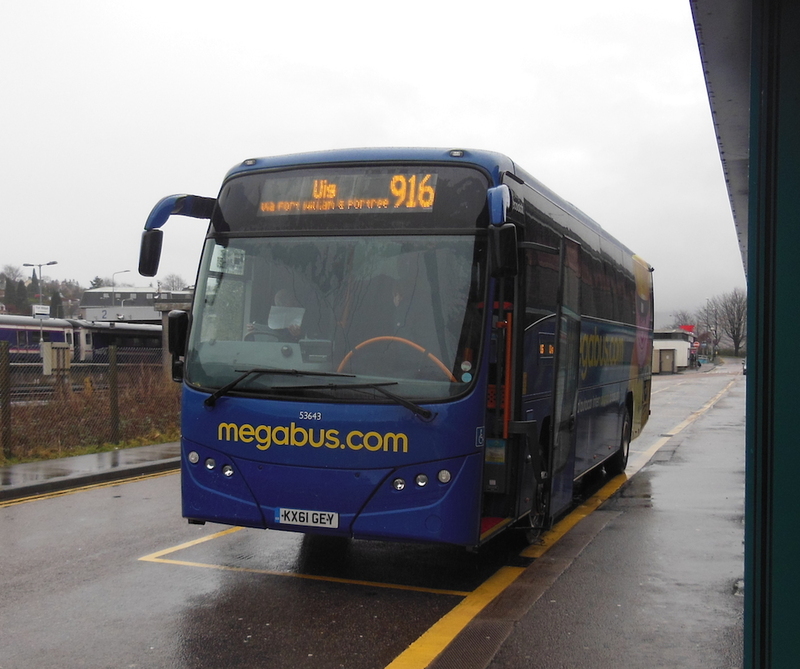 We arrive in plenty of time to get organised and wander down to the bus stop to catch the 8.44am City Link bus to Fort William. It was raining slightly and the cloud base was pretty low. The bus arrived a few minutes early which was good as we were feeling a bit cold dressed in our running gear. I decided to do a video diary of the day so took a video clip as we drove past Glencoe. 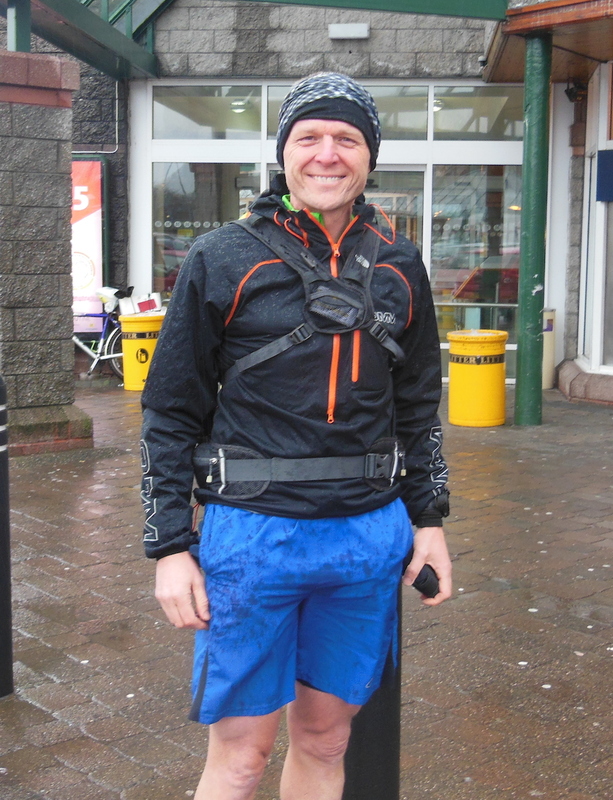 We arrived in Fort William just before 10am, wandered over to Morrisons to take off our over trousers and get ready to run. We took a couple of photos while we waited for watches to sync with the satellites and we were off. We started from Morrisons so it was another 0.3 of a mile. Our basic plan was to run nice and easily and finish strongly. I’ve never done this route going south so I was looking forward to seeing what it was like and it didn’t disappoint. By the time we ran past the leisure centre which is the finish of the whw race the rain had stopped and we were more hopeful for a decent day. We chatted as we climbed up the fire road. I recounted various whw finishes and how it felt and Jonny told me about his walk last summer with his boys on this section. 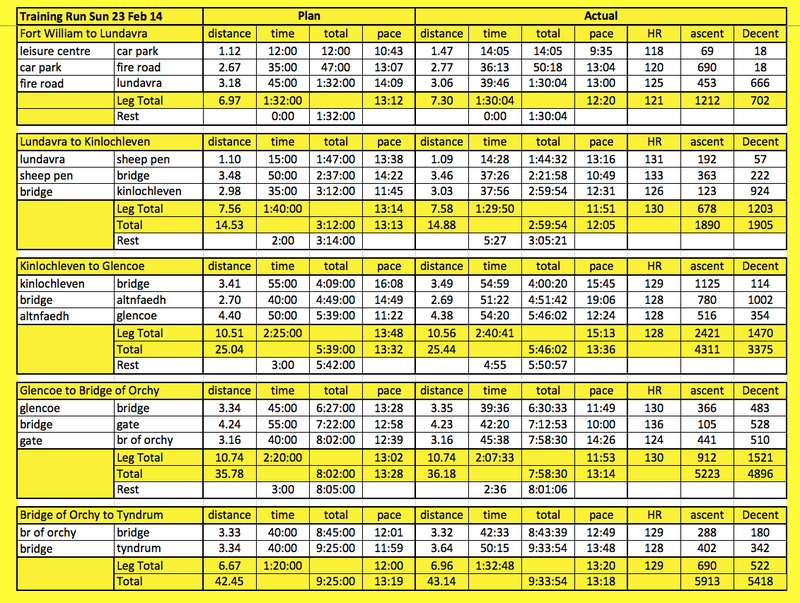 I like to have some sort of plan to work to so had worked out splits for a 9:25 run. I wasn’t too worried either way but I find it helps to break down any run in to bite size pieces. I always find it interesting to see what has changed on the route since I ran it last and it didn’t take long to see the first change. Some of the trees have been felled at the entrance to the Brave Heart Car Park. For my nutrition for this run I wanted to use a combination of things that I know work for me and try a couple of new things. For fluid I’m really happy with the Matrix energy drink so had 4 pouches to add to water. I knew it wouldn’t be a problem finding water to drink today! On this leg I ate 2 pieces of Soreen with jam. Jonny and I had a discussion of when is it best eat. I said that I tend to eat on an uphill walk but Jonny said he finds when he’s running on flatter ground best. He does have a good point as even though I’m walking the uphill I can still be breathing quite hard. The cloud was lifting and we had good views all around. We had a good solid run into Lundavra and it felt a good start to the day. 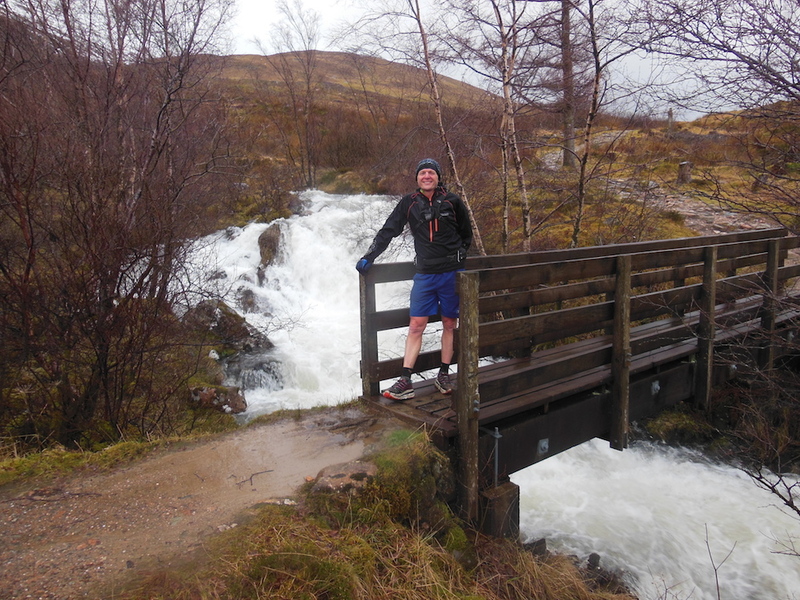 Once we got out of the trees around Lundavra and onto the Lairg Mor the wind really hit us and at places it was pretty hard going but thankfully there were places when we out of the wind and so the running and chatting were a lot easier. I was wearing my Hoka Evos and they are great on the rocky path. 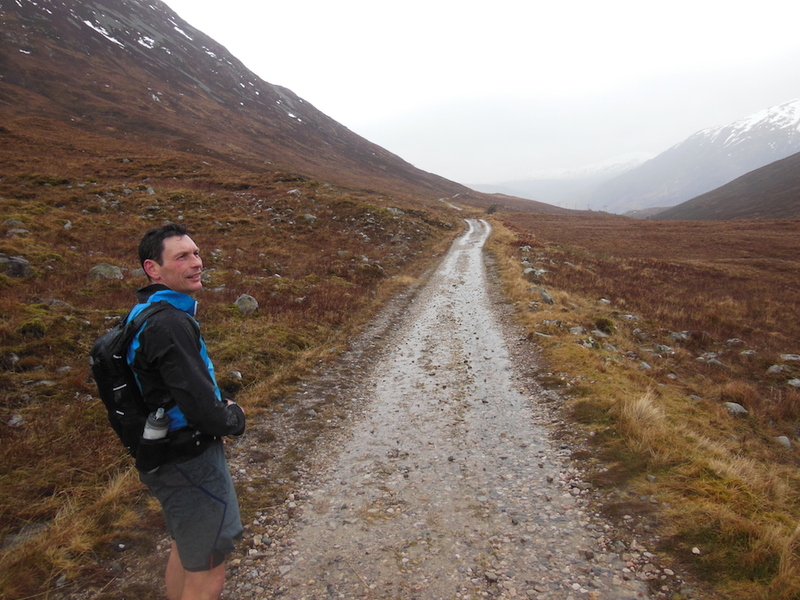 Jonny in his Salomans was feeling every stone and we had a discussion about whether it would good for him to switch to his Hokas from Glencoe or even Bridge of Orchy. We were both running well keeping a steady easy run going. Looking back on my data my heart rate was around 130 which means I wasn’t working too hard which was the idea! I ate some yogurt covered raisins and continued to sip away at my energy drink. I was enjoying running this familiar section but on fresher legs and the other way! My landmarks seem to arrive quicker than I expected which is always a good sign. I always love the view looking down to Kinlochleven but going north it is behind you. Now running south I could enjoy it as it was in front of me. 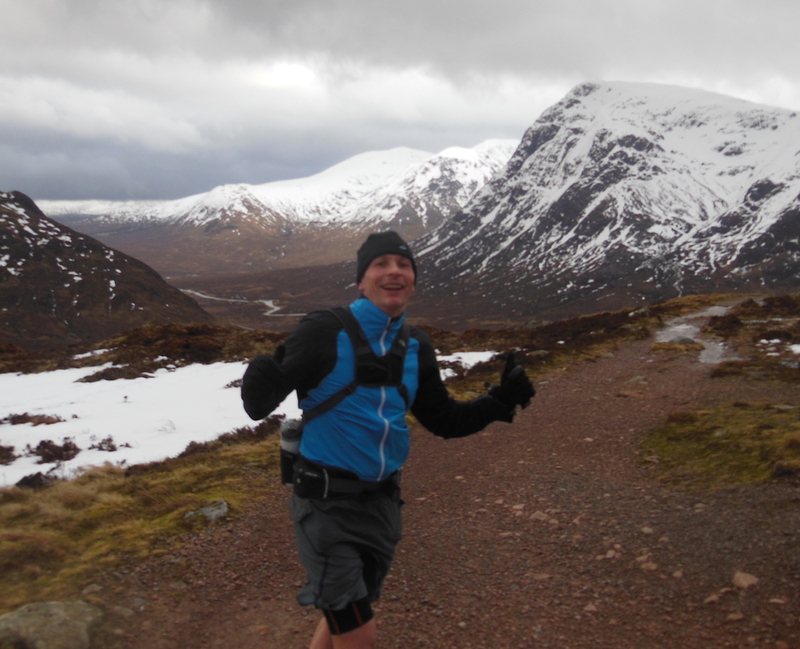 We did a video clip of the pair of us running with Kinlochleven in the distance. I was keen to show Jonny where all the checkpoints are so we went down to the Community Hall and stood outside to eat our snack. On my menu was sweet potato and Jonny had tuna pasta! We stopped for just over 5mins but in that time we got quite chilled and we were keen to get going again and warm up! 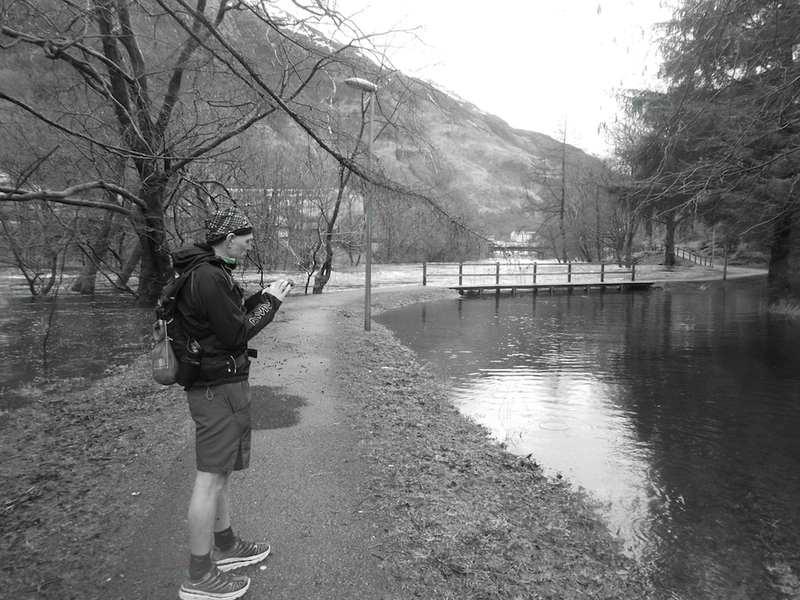 I sent a tweet as we left Kinlochleven which Jonny got a photo of but you can also see how full the river was at Kinlochleven. 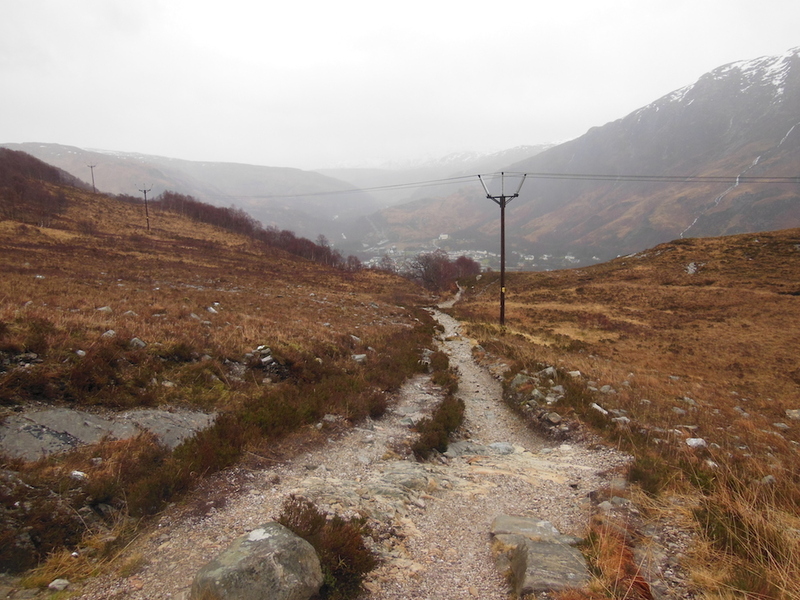 It is quite a climb out of Kinlochleven so it didn’t take us long to feel warm again! I loved seeing all the streams full to overflowing with water and stopped to take photos of most of them! Again running south gave me a chance to see things from a different perspective. There was one water fall which I don’t ever remember looking at because it is tucked away but it was clear to see running south. Near the top of the road we saw our first walker out with his dog. Thankfully the dog was more interested in the massive stick in his mouth to bother with us. Once we got up to the top we were interested to see whether we would be running in snow. Ian Minty had mentioned on facebook that he was wading through 3ft of snow on Wednesday but we weren’t sure whether the rain over the last few days will have washed it away. The higher we climbed the more snow we encountered on the path. I had carried my Khatoolas but didn’t really want to wear them unless it was really necessary. At the bottom of the final climb where you cross two streams on stepping stones the snow was quite thick. So the climb up was slow going through the snow. Sometimes we’d go down to our knees. My feet were getting pretty cold and for the first time in the run I was feeling a bit uncomfortable. We were wearing jackets and shorts which is fine when you are running and producing some heat but when you are walking slowly you quickly cool down especially when it’s windy. We eventually reached the top of the Devils Staircase where we paused to take a few photos on the strong wind. Both of us were keen to get running again to warm up! Jonny led the way down as he is so much stronger on the downhills than I am. We passed a group of 15 or so walkers who were heading up the hill. They were all dressed in full waterproofs, hats and gloves. I’m not sure what they made of us as we ran past in our shorts!! Once we reached the bottom I did a short video clip and realised that we’d run 21 miles which was about half way. Jonny wasn’t too impressed that we still had the same distance to go! 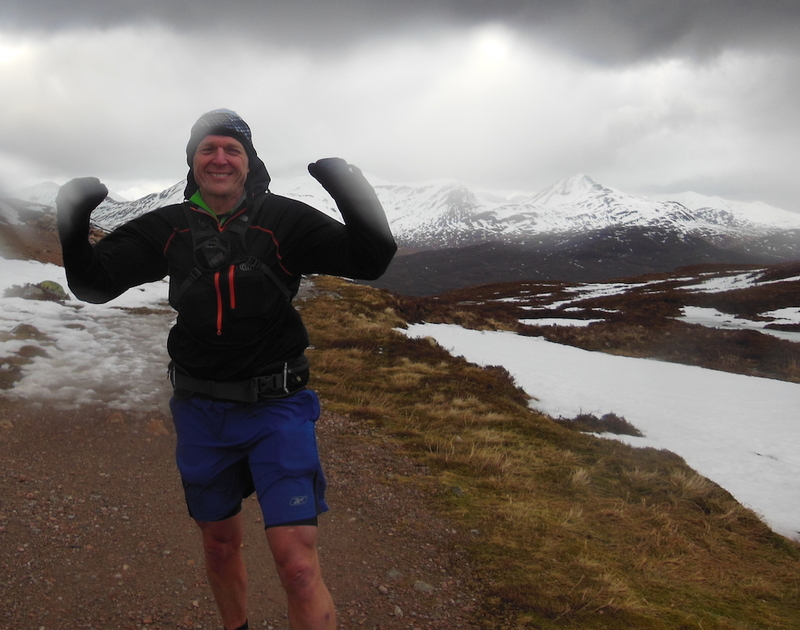 It was good to get a decent run going on the path towards Kingshouse and Jonny told me about his walk with his boys when he’d said to them Kingshouse was just round the corner! 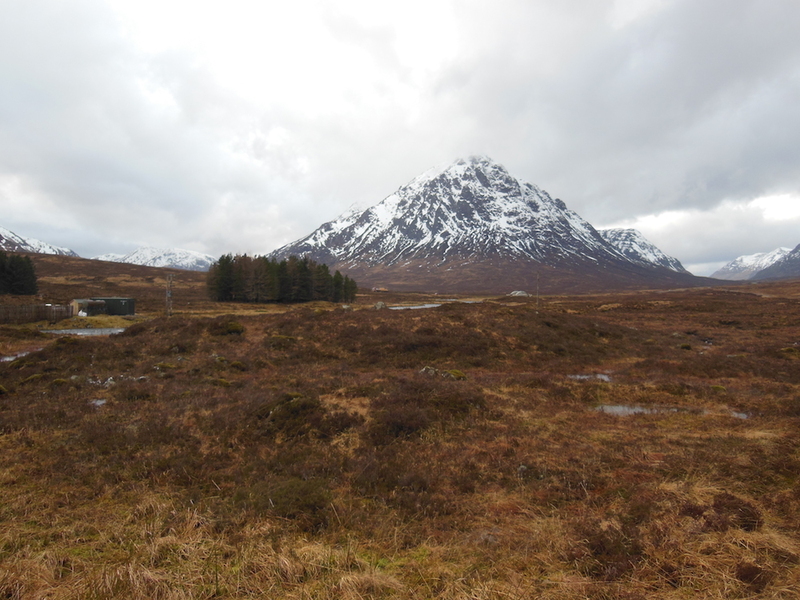 It started to rain for a while and we were battered a bit by the elements but soon enough Kingshouse appeared. We ran straight through as I wanted to show Jonny where the checkpoint is at the car park at the ski centre. Jonny was feeling that he was holding me back a bit so suggested I took the car key and if I wanted to push on then he was happy with that. 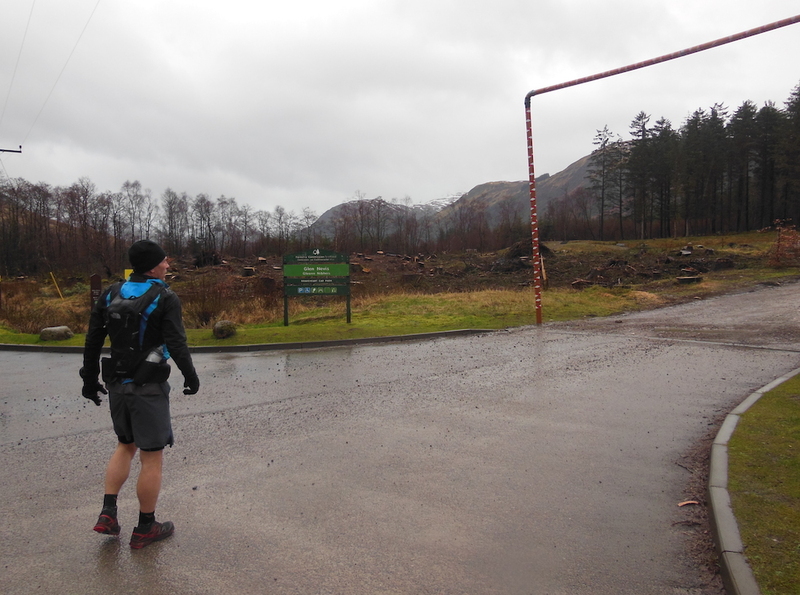 He thought he may stop at Bridge of Orchy and try and get a lift to Tyndrum. We stopped for 5 mins to eat some food. I think Jonny had a samosa and I had a Greek Style Yogurt which are my current favourites! Again we were both keen to get going as it was pretty cold and wet. We were both running with our NorthFace Indo packs which we find really comfortable. I added on a dry bag on the outside for extra space. This is something I copied from Dave T but I haven’t quite got the fastening quote right so I had to stop to sort it out. I’ll have to get Dave to show me show he does it!! Jonny said he was struggling on the first hill but we stayed together to the top and then all the way down but once we hoot the next hill he encouraged me to push on. We had been running for 6hrs 25mins chatting most of the way so maybe he was sick of my stories!! He must have heard them all by now. I had been feeling really comfortable all the way so far and was interested to see how my legs and body would respond to running a little quicker. I still had over 3hrs to go so didn’t want to push too hard. I got into a good rhythm and ran all the flat and downhill. I also ran some of the uphills but only until I felt I was breathing a little too hard. Somewhere along the Rannoch Mor I met a couple walking towards me. I stopped for a quick chat and asked them to give a cheer to Jonny when they saw him …. which they did! I was pleasantly surprised how quickly I reached the forest and then long descent to the gate. It was lovely to be able to run all the way down rather than climb the other way that we do in the race. I ran the 4 miles from Ba Bridge in 42mins which was encouraging even if a lot of it is downhill! The river was very swollen so time for another photo. I ran most of the road to Inveroran Hotel and they climbed up the hill. 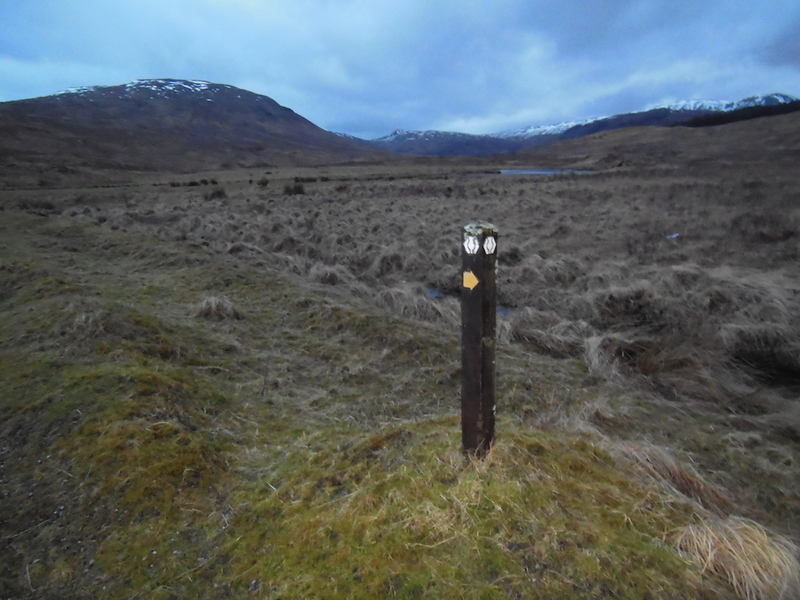 It was starting to get dark but I hoped I’d make it to Bridge of Orchy before needing to get out my head torch. I felt the climb up took longer than I expected but I was moving okay and I eventually made it to the top. I did a video clip as I went past the spot where Murdo gives out his encouragement and jelly babies. He is doing the race this year so not sure who will take up that role?? As I descended to Bridge of Orchy it was getting darker and I suppose I should have stopped to put my head torch on but didn’t want to stop on a downhill run so decided to keep going as best I could. I also realised I’d run out of my energy drink so put a new scoop of powder in my water bottle but couldn’t find a stream to fill it up. I was going to eat a 9 bar but knew I’d need some water to help eat it. I arrived at Bridge of Orchy in almost total darkness so the last 15mins was pretty tricky. I found my torch and set off after a couple of minutes to run the final section. As I walked up the hill I sent a tweet in cased anyone was interested in my progress (!??!). I also wondered whether Jonny would stop or carry on. I knew I’d find out soon enough. 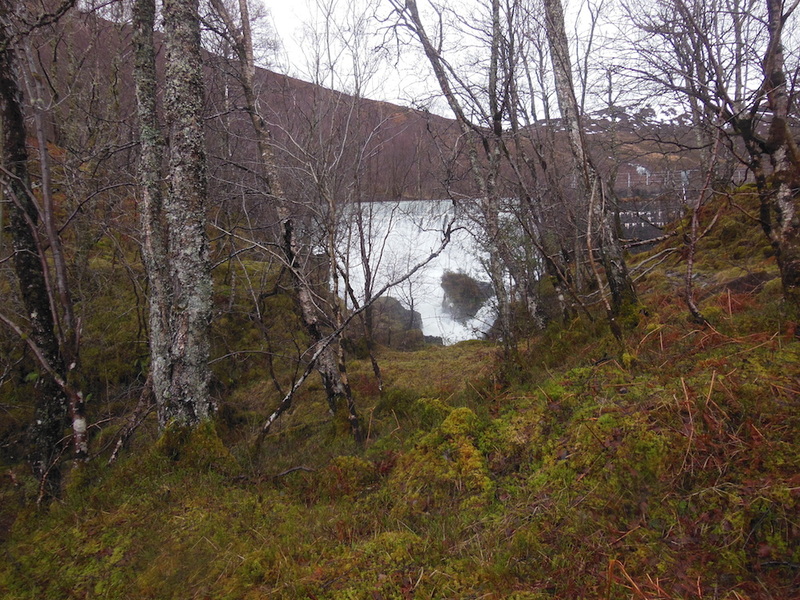 I was feeling okay but decided to walk the hill out of Bridge of Orchy. I realised I’d not eaten for well over an hour and really needed to find a stream to refill my water. The first couple of streams were well under the path and I didn’t fancy scrambling down. The third one wasn’t too far off the track so I refilled there. As I looked back I saw a head torch! My immediate thought was that can’t be Jonny. He must be a while back!! So I serf off knowing that whoever it was would catch me soon enough. I couldn’t imagine anyone else wold be out here running in the pitch dark at this time of night so I assumed it was Jonny. What a great run he must be having because I didn’t feel I’d slowed down that much. When he caught me he had a massive smile from ear to ear! 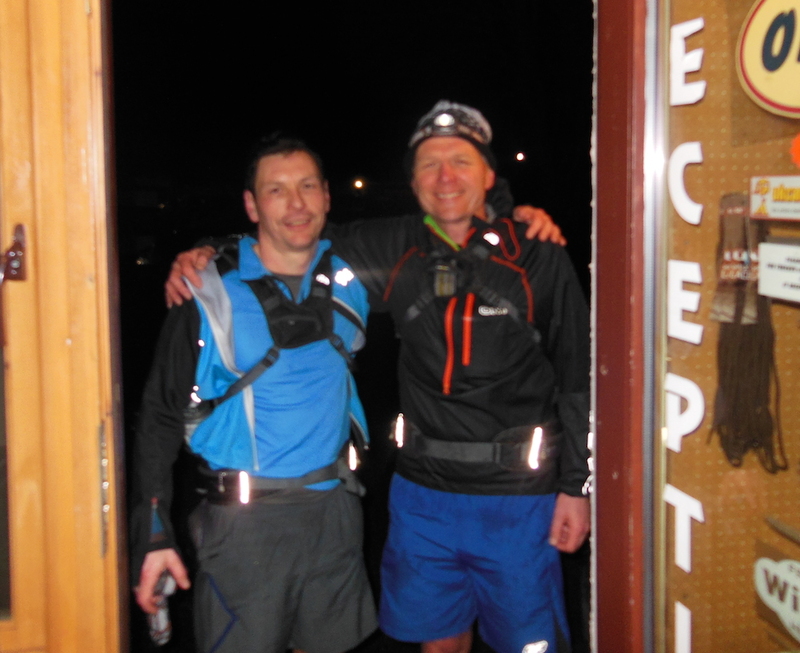 He too had seen a head torch ahead but didn’t think it was me as he assumed I was long gone! So we ran the final 5 miles together. I was really pleased for Jonny because a year ago he would never have been able to do that. Even 6 months ago. So it shows just how important consistency is. Jonny has been running 5 times a week every week since the new year and you can see the benefits. We walked most of the uphills but everything else and soon enough we were going under the railway line, another climb then the long descent to Tyndrum and the By The Way hostel. We called in to see Kirsty who gave us the code to get a shower and took a photo of us. It was so good to be able to have a shower 5 mins after finishing the run. Thanks again Kirsty! It was hard to get out!! We decided to grab something to eat but the Real Food Cafe had just closed so we drove to Crianlarich and treated ourselves to a Steak Pie! We were back in Drymen at 10pm but I didn’t fancy driving home on my motorbike so stayed the night and left at 6am this morning. So thanks Jonny for a great day out. I was really pleased with my run and now there is less than 4 week to recover and get ready for the Hardmoors 55 race on Saturday 22nd March. I feel very positive about it and I’m happy with how my training has gone over the last few months. This entry was posted in whw training run. Bookmark the permalink. Huge respect to you both, what a fantastic run and an inspiring read!